Almost everyone has memories of tuna casseroles and tuna sandwiches when they were little. 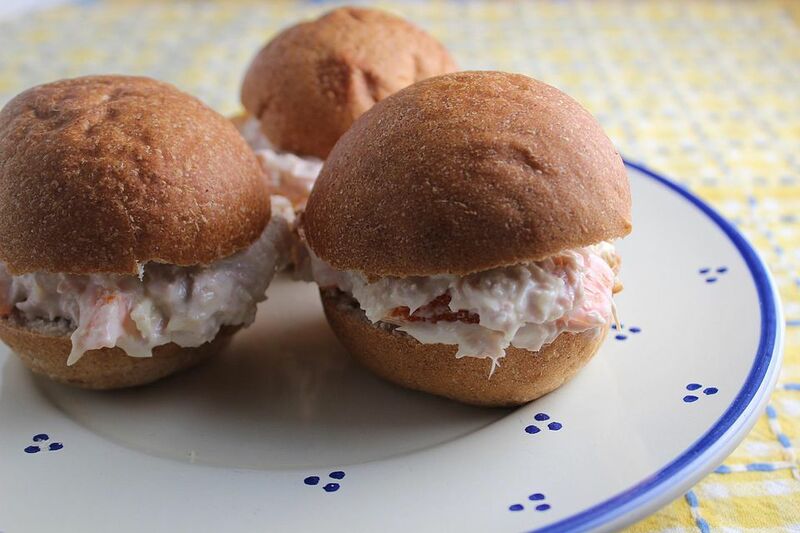 My favorite recipes for canned tuna were the sandwiches my mom made on whole wheat bread. They were very simple but full of flavor. These recipes start with canned tuna. Do you know what the words mean on the tuna cans that you buy? Tuna comes in three forms: solid pack or fancy, chunk, and flaked or grated. Solid pack is the most expensive, and contains large chunks of meat. Chunk tuna has smaller pieces and is less expensive. And I don't recommend flaked or grated at all; the tuna is very mushy, from less desirable cuts. There are also different varieties of tuna to consider. This is the most expensive tuna. Canned tuna made from albacore is labeled 'white'. It has the mildest flavor and is easily substituted for canned chicken in most recipes. This type of tuna and other varieties are labeled 'light' on cans. It has a slightly stronger flavor than albacore. 'Light' tuna can contain several different varieties of tuna. This tuna has the strongest flavor and highest fat content. This tuna is usually sold canned. If the can you're purchasing doesn't say 'white' or 'light', it's probably bonita or skipjack tuna. There are some brand new varieties of 'canned' tuna. Sealed, shelf-stable pouches of tuna are a recent addition to the market. The flesh is packed with no water or oil, and is processed for a shorter period of time, resulting in a fresher flavor. There are several different flavors of this tuna to choose from, accented with herbs and spices. Tuna is packed in water or oil. Tuna packed in olive oil has a fabulous flavor, and when well-drained, doesn't have that many more calories than tuna packed in water. It's difficult to find, though, and tuna packed in water is just fine in these recipes. Tuna packed in vegetable oil really has no additional flavor, and in my opinion isn't worth the extra calories. Finally, make sure that the tuna you purchase is labeled 'dolphin-safe'. Several organizations, along with the U.S. government, have instituted monitoring programs to help protect these mammals. Some companies have pledged to continue 'dolphin-safe' fishing practices even if U.S. standards are weakened, which they may be. Recently there have been media reports about mercury content in fatty fish, like tuna and especially salmon. Some governments recommend that you limit your tuna consumption to two cans a week. One study found that 'light' tuna has less mercury than 'white'. Think about all of these things when you purchase tuna for your family. Tuna is considered a heart-healthy food since it is rich in omega-3 fatty acids. It is low in fat and carbohydrates and high in protein. It combines beautifully with most flavors, from capers and onions to honeydew melon. Best of all, most kids like tuna! Try some of these tuna recipes this week. I'd recommend solid pack or chunk tuna for these recipes (except for those calling for sliced smoked tuna). Read the labels, and also keep an eye out for canned or vacuum-packed tuna on sale. Canned tuna, properly stored, will last for a year in your pantry. And you'll always have ingredients for an easy meal on hand! This George Foreman Grill recipe is simple and classic; a tuna sandwich at its best! This is just like the sandwiches my mom used to make. There's something about the combination of tuna with Parmesan cheese, mayonnaise, and red bell pepper. If you like your food spicy, think about adding chopped jalapeno to this easy sandwich spread. Risotto is such a wonderful dish. The creamy rice, when combined with savory tuna, lemon, and fresh spinach, makes a great easy dinner. This five ingredient recipe is super fast! You can add frozen vegetables, thawed and drained, to this basic recipe for more flavor and nutrition. This simple salad plays off the classic Waldorf Salad, but uses tuna instead of chicken so it's less expensive. You'll love this fresh and light salad. Talk about back to the future! Tuna croquettes is a 1950s throwback that I believe everyone should eat at least once in their lives. Carbonara is a combination of spaghetti, eggs, and olive oil. This easy recipe adds tuna and some chopped vegetables for a great main dish. Have sandwiches ready in an instant with this easy and tasty recipe.